In the Oceanography course I teach at a high school we are studying the development of echo sounders and their influence on bathymetry and the charting of the seafloor. Believe it or not, the tragic sinking of the RMS Titanic was very instrumental in stimulating research that developed technology for more rapid mapping of the seafloor. It was called an “Iceberg Detector and Echo Depth Sounder.” This ended the labor-intensive work of heaving a lead-line (which I still use aboard my boat) overboard and retrieving as much as 1.25 miles of rope for each depth measurement. The echo sounder, although not perfect, still aided in creating the first comprehensive charts of the ocean floor, which were compiled in 1959. 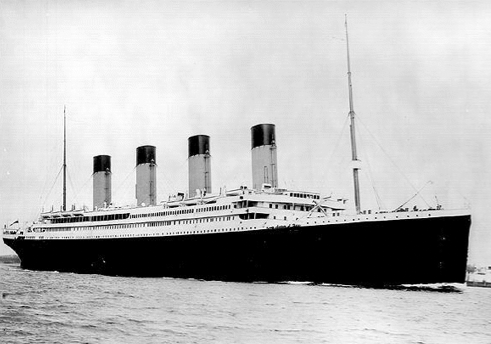 Tomorrow is the 99th anniversary of the sinking of the Titanic. 99 years ago tonight, in just a few hours, the Titanic struck an iceberg. What I find interesting about this was that it struck an iceberg significantly south of my projected goal for seeing an iceberg in just a few months. Then again, it was 99 years ago! Today’s report indicates that there are currently no active icebergs in that area around Newfoundland. Much like Twitter is today, a century ago Morse code was a new form of communicating short messages long distances. Ships like the Titanic used it to transmit distress messages and updates. Tonight you can “hear” the Titanic’s original Morse code messages in real time via twitter. This is a remarkable occasion where we can follow the messages at the same pace that the world received them on that tragic night that the “unsinkable” ship was in trouble. Follow http://twitter.com/#!/ns_museum tonight to follow the tweets of the RMS Titanic’s Morse code messages exactly 99 years ago. This summer I plan to sail north to see an iceberg. But that is only one goal. Even more exciting and challenging than that will be to help make a documentary called One Simple Question that illustrates the complex relationship between Voluntary Simplicity, ice cap depletion, and a healthy and happy lifestyle. As you know, most creative dreams are faced with a lot of challenges such as obtaining adequate support and finances. What I’m asking you to do is very simple and will take just a moment. Please visit our film’s website and join the Facebook community, or sign up on the email list. Then click on the Kickstarter link and watch our short video. You’ll see the great team of creative people that have voluntary come together to make this movie. Please consider donating $1 to the project, then share the link with ten friends. We only have 27 days to reach our fundraising goal! Update: Anyone who contributes to the project in the next 24 hours will receive their name and a big thanks in Morse code from the team of One Simple Question! I LOVED my Morse code video “Thank You” for backing the movie!! I love the sound of Morse code… and it’s faster than SMS! Great clip! Those guys are hilarious! Sorry for this stupid question but do you have a blog and if so where is it? Yes, Heda. My blog is http://www.sailingsimplicity.com. I wish I would have read this post earlier. How interesting though that Titanic was an “unsinkable” ship… and it sunk. Great post though… I didn’t think it was already 99years since it happened. I thought it might have been less… i guess i never did the math.